Find a paradise in the heart of pulsing city. Discover Angkor Wat temples from the comfort and tranquility of Angkor Pal Boutique Hotel located in a peaceful area near the heart of Siem Reap. Whether you look for a starting point to explore temples of Angkor Wat, relaxation at the swimming pool or enjoying the city life, Angkor Pal Boutique Hotel is the place to stay at. You can enjoy relaxed friendly atmosphere and still be within a walking distance from the old market, night market and pub street. Our rooms are modern furnished with a double or twin bed, desk, shelf, TV and air-conditioning or fan. Angkor Pal Boutique Hotel Siem Reap, offers voguevacation, whether for long term staying or business staying, we perform our hospitality funtions as a regular hotel, however with VIP individual care services. We aim to be the first choice Boutique Hotel where care during your stay is offered with high degree of personalization, and guest satisfaction and a unique experience not offered by other boutique hotels in Siem Reap. All rooms have en-suite bathroom and Wi-fi is available in the whole building. All rooms have windows facing the garden. Our staff will make you feel welcome and will make sure your stay is wonderful. Our garden restaurant provides delicious western and Khmer food. Thanks to the location you will feel a bit closer to local people, who are welcoming and you will feel like in a homestay. If you wish to forget the bustling tourism for a while and relax still being close the city, Angkor Pal Boutique Hotel is the place for you. 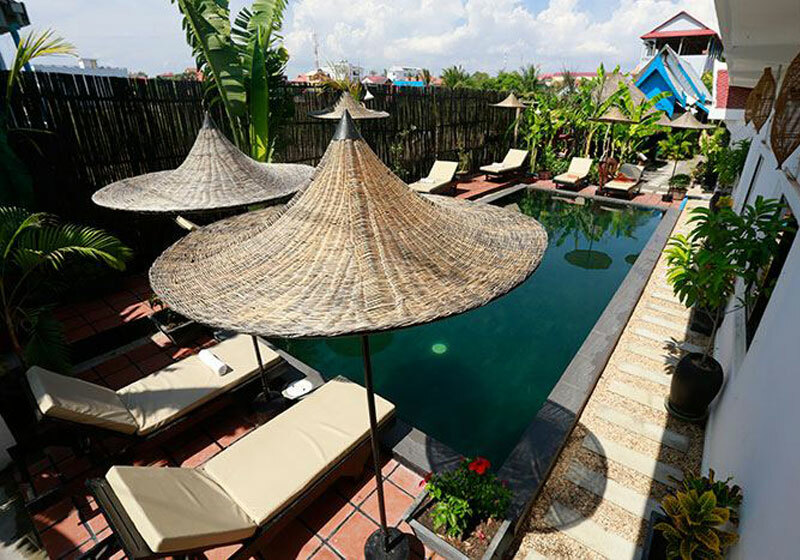 Short Description: The comfort and tranquility of Angkor Pal Boutique Hotel located in a peaceful area near the heart of Siem Reap. Whether you look for a starting point to explore temples of Angkor Wat, relaxation at the swimming pool or enjoying the city life, Angkor Pal Boutique Hotel is the place to stay at.